Why into the LFO section the multiplication and division ratios the 5X, 7X, /5, /7 values are missing ? Not really a problem, just curiosity. It seems a great module. Code-wise it is indeed not a problem to make the list longer. However, on a pot it becomes difficult to easily select a value if there are too many. So we had to make choices. Initially, that setting was on the selector. Since it made good fun being able to change it with a CV, we put it on the pot to also get instant tweaking to any div/mult ratio. Code-wise it is indeed not a problem to make the list longer. However, on a pot it becomes difficult to easily select a value if there are too many. It would be nice to have a "quantize like" section for the LFO's subdivision/multiplication, maybe with choices like the three into the doepfer A-160-2 (power of two, prime numbers, integer). Just a thought for future upgrade. My system is almost entirely analog, i waited for one digital source that give me this flavour on the table. When i saw this module something clicked in the best way. How to obtain in the USA? Website says available through Amazon only....no listing. is it possible to cv switching through the Modes ? , like Metamode in Braids ? Currently not. We didn't think about it and it has not been asked by our testers contrarily to some other advanced features. But given that the Twin waves' firmware can be user-updated, this is a feature we could implement if there is enough interest. that would be awesome, highly interested, and at least a reason to buy it for me. Great feeling, no trouble with pots sharing function. I have no previously experience with digital oscillators, so i cant compare, but i enjoied it very much. Both sections, osc and LFO, delivers what promised. And now i have some sound and timbre that were out of reach for me before in regard of tuning stability and general consistency. I'm looking forward for its future grow. Mine's on order from Amazon....due end next week. For those who have it, what do you think about using it as an LFO? Can you achieve some fun shapes with it? Sure you can, the two LFOs are independent or not at your choice. They share the sync/clock input but they are independent at various degree of subdivision/multiplication or they can run free. There's not intermodulation under the wood, but you are free to patch the module into itself. The only thing you need are some attenuator and/or VCA, since its inputs are unattenuated. For me the key thing is the sync/clock capability, unpredictable shapes can be incapsulated into specific timing and its declination. Best thing: you are also free to not to. yes that's right; however, in LFO mode, the Fine pot works as output level and the FM/AM jack becomes AM. They jointly control the output level of the LFO. Ops ! I forgot to mention that part. There are 7 algos in the LFO mode, but this gives you far more than 7 frozen shapes. These can be simultaneously and independently CV + manually changed in frequency, amplitude, and shape (or some other relevant parameter). Thus without any patching you can already have variations such as saw to triangle to inverted saw with every nuance in between. But there are also less obvious tweaks such as phase distortion of a sine wave. Once you start patching of these, the wave will act on itself to distort into something less usual. (e.g. double peaks along a ramp). So, still cyclic but weirdly shaped. Then you have the non-standard waves: Brownian S/H and vectors. Vectors are not widely known. They are segments moving from random level to random level. We have two variations: regularly timed but with a Brownian randomness limit setting (from stay in place to full random span allowed), the other controlling the time irregularity. From purely cyclic to widely variable. Again these setting are manual + CV. Imagine how the shape of one can act on the rendering of the other thanks to the various CV inputs available. Another approach is to use the sync instead of the clock to have one LFO acting on the other, eventually adding some CV modulation from the master to the slaved LFO. LFO section is really cool ! And the very nice feature is they got both VC amplitude ! Hmm, I do see possibilities here. Your gonna go blind one day - big forearm? As for LFO's - I am really enjoying the Vector algos here - unique and fun. 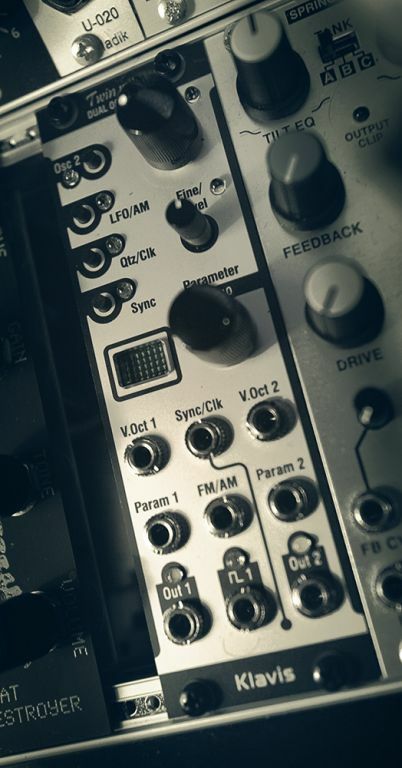 It can be a dual LFO with sync or not (you choose for both sides what you individually want even if there is only one sync input), Free/ mult/div (you choose individually for both), standard waves/vector/random (you choose individually for both), modulate waveshaping/ pulse width (depends of the algoruihm) for both (individually)...so i assume the answer is YES !